Luxury hotels represent an ideal way to spend a romantic weekend or week, and can be worth the extra cost if you want to create a more memorable holiday in a memorable destination. The best luxury hotels combine a great location with outstanding facilities and services, and should always be thoroughly researched before making a decision on which one to choose. In the same way, it is important to think about whether you want a particular type of luxury hotel, from somewhere secluded to a site located in an ideal place within a large city or resort. 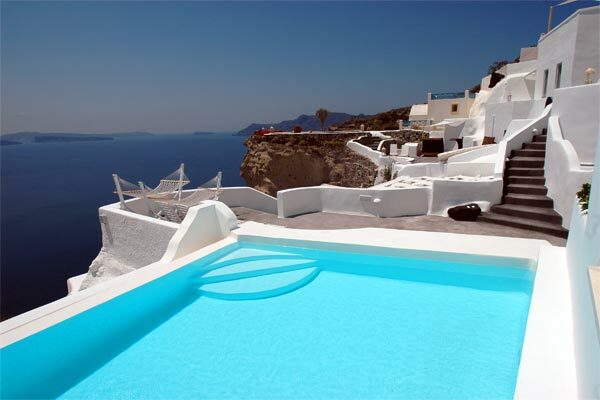 Ideally placed within the luxurious resort of Santorini in the Cyclades, the Grace Santorini hotel boasts world class sea views, and has recently been expanded to include even more luxury suites with built in spa facilities. Honeymoon suites are particularly recommended for their views over the sea, and their soft furnishings. Other notable facilities includes a large swimming pool, champagne breakfasts, and alfresco and indoor dining. The Montagne Alternative in the Swiss Alps offers luxury skiing and accommodation features. The lodge is located within the small village of Commeire, and offers peaceful relaxation within the mountains. Guests stay within renovated barns, and are able to enjoy a wide range of fresh produce from the village. In this way, the lodge offers both the best Alpine skiing and opportunities to escape the rush of the winter season within the enclosed village and luxury buildings. Getting away from the crowds in Ibiza is important if you want to really enjoy the island. Based on a site that has been used since the 17th century, the country refuge contains a wide range of country furnishings and local food. Suites include all modern amenities, while each room contains distinctive decoration. Other attractions involve essential oil messages, and spa treatments. The quiet Ibizan countryside is also only a short drive from the busier, more tourist oriented parts of the island. Part of the old city area of Antalya, the Tuvana hotel is regularly awarded prizes for its consistent quality of service. 46 rooms provide access to some of the most luxurious furnishings in the region, with romantic decoration adapting 18th century styles. The hotel also features world class dining, as well as access to the beauty of the Antalayan coast, which also features various sporting parks and sailing. Currently visiting France and exploring boutique hotels in Paris but finding none to include in this list Matt Mynors is a travel enthusiast writing on his experiences and his plans to travel the world.